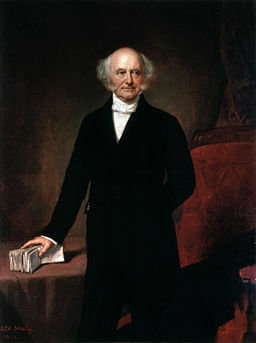 Martin Van Buren was the first president born in the official United States of America. His ancestors were Dutch. Van Buren’s father managed a tavern in Kinderhook, New York. Politicians often dropped by for a drink and talked about their ideas. Listening to them gave young Martin an early interest in politics. His family couldn’t afford to send him to law school, but he studied on his own while he worked as law office clerk. Soon he entered state politics. Van Buren got his nickname “The Little Magician” for his talents as a shrewd negotiator and political organizer. By the election of 1836 Van Buren had already helped to organize the new Democratic Party. His former party, the Democratic-Republicans, was crammed with members who just wanted to argue with each other. The new Democratic platform extended Andrew Jackson’s policies of limited federal government and promotion of states rights. Though Van Buren was a gifted politician, he is largely regarded as a failure as president. The economic crisis he inherited from Jackson only got worse under his watch. Not all of the factors were within his control: for example, England also had an economic depression and English banks stopped dealing with the United States. Unemployment among American workers soared and so did poverty. Unlike future democratic president Franklin Roosevelt, Van Buren never offered the American people federal assistance. He thought the government should leave people alone. He did, however, want to make sure that the government had money. He proposed an independent treasury so the government wouldn’t have to keep its money in struggling individual banks. The establishment of the U.S. Treasury would have been a victory for Van Buren, but it took him years to convince Congress to pass the bill. By then the public blamed him for the economic crisis and Van Buren was not re-elected.